Full line of interchangeable barrels ranging from 2.5" - 6"
I'm really impressed with the Ranger II .45/.410. I carry it everywhere and like a good knife, I love when I use it for its intended purpose. These aren't your typical handguns! We manufacture our guns in Granbury, Texas and sell to Distributors and Dealers throughout the U.S. and Canada. Our double barrel handgun is the smallest, most powerful, best built personal protection you can carry. We currently offer 17 different models, as well as 37 interchangeable barrels that are made of the highest quality Heavy Duty Stainless Steel which will fit on any of our guns. 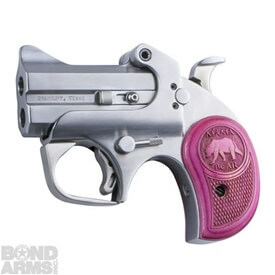 We also have the world's most revolutionary semi-automatic handgun with our Bond Arms Bullpup. The Bullpup generates superior speed and accuracy making it the smallest, most powerful, 9mm of its size with a 3.35" barrel in an overall length 5.1" handgun that is only 17.5 ounces. 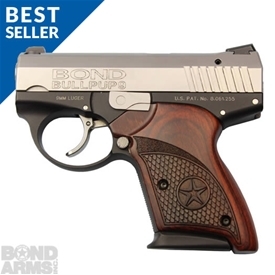 We carry a full line of accessories including holsters, barrels, grips, display boxes, and even apparel that includes hats and shirts for our super Bond Arms fans in our online store. we have something that will fit your needs! 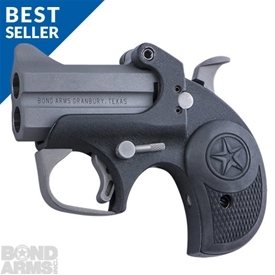 The handguns listed below are available either through our online store, or through authorized dealers.